En español, en français, en català. We have always defended the notion that the value OTAs have is to provide visibility to hotels and help them generate new sales, sales that otherwise would be impossible to access. This greater exposure, by generating more demand for you, allows you to increase your average price, not only for OTAs but also for the rest of your channels, something which is highly positive and has a direct impact on your RevPar. These are two great value proposals which, at least to this day, make OTAs key elements in online sales of hotels. But that is where it all ends, or at least most of it. All sales channelled by Booking.com or Expedia whose origin is a client who already knew you, a recommendation from a friend or a client who found you on TripAdvisor are completely absurd. You are paying a high cost for a sale that was already guaranteed, so to speak, as long as you cover minimum requirements: good technology, website and booking engine, languages and adequate usability on your direct channel. This is the reasoning to argue in favour of the strategy that, as a hotelier, you must try to remove OTAs from AdWords, since they do not provide value. We estimate that approximately 15% of sales from Booking.com come from AdWords with your brand name. It is understandable that they are not keen to stop bidding. A large part of their business comes from this simple practice. Can you imagine moving your direct channel, even if it was half the amount, without losing out on total sales? Fortunately, hotels have internalised the importance of removing OTAs from AdWords bidding on your brand and some are already seeing some great progress. However, the new battle with OTAs takes place on metasearch engines, since they already represent 45% of unique visitors of the travel industry. Once again, OTAs have been the first to integrate into metasearch engines, which has helped them maintain and even increase their dominance. Their presence there is an “acquired right”. It is estimated that Booking.com already allocated between 25% and 50% of its marketing investment in metasearch engines. Doesn’t it sound exactly the same as AdWords? Who will be the brave soul that will get them out of there? Those who have tried it have obtained a negative reply. For OTAs, leaving metasearch engines is not even up for discussion, at least for now. They have nothing to gain and a lot to lose. …. what does the presence of OTAs competing directly with your website give you? However, metasearch engines have recently evolved a lot. As well as price comparison websites, they also want to be “hotel searchers” and control the point of origin, where the client starts his trip. 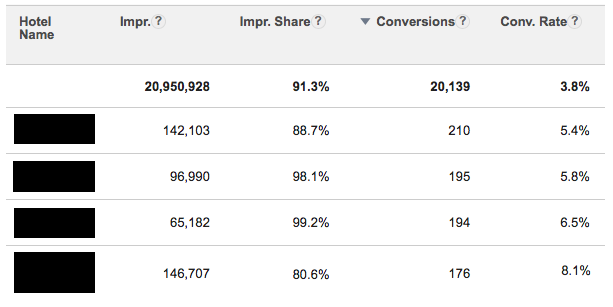 Interestingly enough, this point is the highest one in the funnel, where there is a higher volume of users. It is a fantastic opportunity to continue monetising its traffic. This movement allows them to compete directly with OTAs, something which is creating interesting reactions and relationships between OTAs and metasearch engines. A great topic for another post! For hotels, the evolution of metasearch engines is positive. Many see it as a “new toll to pay” although it is much more than that. If “providing online visibility” was a value proposal exclusive to large OTAs, that is no longer the case and metasearch engines are starting to become an alternative. Does this twist of metasearch engines alter the “value” of OTAs being present in their results? … and finds many hotels available …. … once again, what do OTAs competing directly with your website give you? Once again, nothing. Nothing good. Larger marketing cost on metasearch engines, since these operate just like AdWords, with a bidding system. The more competition from OTAs there is, the larger your bid will have to be to get into a good position. Larger distribution costs, since many of these sales which go through metasearch engines will end up arriving via OTAs. We are talking about an additional cost which ranges between 3% and 10% approximately (the difference between the cost of OTAs and the cost of website+metasearch engine). Direct sales via metasearch engines are not cheap by any means, but it is feasible to make them more profitable than those via OTAs. Lower income per booking, since you are losing all the extra services that you can offer on your website in comparison to OTAs (extras and upselling), both during the booking process and through pre-stay email marketing strategies. Higher OTA dependence and, therefore, a bigger future risk. Lower loyalty-building capacity, because by having lower direct sales there is less chance of building loyalty with your clients and making them fans of your hotel and direct channel. At Mirai we measured what happened with direct sales when Booking.com is not on metasearch engines, showing a positive impact for hotels, especially for those which have few distribution channels and a controlled price. If, as OTAs say, their conversion is better than the one on my website, is there any risk of losing out on sales if I exclude them from metasearch engines? They cover many destinations. Your website covers just one (or a few if you are a chain). They have almost all accommodation options in that destination. Your website just has one or a few. Most times they have better prices, since many OTAs partake in price disparity. When they don’t have the best price, at least they have parity, which is the general policy of most hotels. They have accounts with advantages for users, such as points and future discounts, which once again gives them a competitive advantage. Their website has dozens of different languages, while yours has 4 or 5 at most. They invest a lot in technology and usability and carry out continuous tests. On the other hand, the conversion rate of hotels is lower since a lot of their traffic does not generate any bookings because the purpose behind it was not to book in the first place. OTAs do not provide the email address or telephone number and the users who want it have to go to the hotel’s website. Hotels with restaurant, spa or golf generate a lot of traffic which is not related to bookings. It is a similar case for hotels with MICE, which include event rooms and different event services. A lot of its web traffic is related to matters of this kind, which is key to them. Many clients who arrive at their destination and want to go to the hotel search for the address in order to tell the taxi driver or for the metro. Once again, they visit the hotel website without booking. Therefore, the question isn’t “who has a higher conversion rate: Booking.com or Expedia or my website?”. We already know that answer. The correct question is “who has a higher conversion rate: my hotel page on Booking.com or Expedia or my website, but only when the user arrives here via a metasearch engine?”. The answer here is nowhere near as clear. Up until a few years ago, Booking.com offered hotels on its extranet a valuable figure: the number of views of their hotel page and its conversion ratio. This figure would be the most indicative one to compare with your website’s traffic filtering by name searches on Google and views from AdWords and metasearch engines (excluding, therefore, all direct traffic from the hotel Wi-Fi and other traffic sources). Unfortunately, Booking.com no longer provides this figure. It was highly valuable information for the hotel which revealed sensitive data, data which Booking.com now prefers to conceal. At Mirai we go beyond that and believe that the conversion rate of hotel websites can be even larger than the one on OTAs, especially if they have the best price. Our data shows that the conversion ratios of metasearch engine users are above average, including above AdWords traffic and organic traffic (mostly searches by names). We are talking about aggregate data from hundreds of hotels. If we focus on the ones that do it best, we can observe large volumes of bookings with high conversion ratios. Lastly, in the test that we did removing Booking.com from Google Hotel Ads for 4 months, we were able to see that not only did the conversion rate go down but that it also went up when Booking.com was not there, reaching figures close to 8%. It is hard to believe that OTAs are more efficient than hotels with good technology at their disposal and a good strategy on their direct channel. What is the future of metasearch engines without OTAs? Large OTAs would impose their strength when negotiating this particular point and, except with large hotel chains, would not give in to hotel demands. There are thousands of OTAs with which hotels have no direct contract and are fed from the B2B/bed banks and their affiliation programmes. Achieving for these OTAs not to appear on metasearch engines is even harder and it would always be via the providers with whom you have a contract, not directly. Most hotels do not have any presence on metasearch engines with their direct channel and, therefore, removing OTAs would be counterproductive since it could result in a loss in sales. If it came to that, metasearch engines would strongly oppose this since it would be the end of their raison d’être. Let’s not forget about the users, who would be those most affected by this. 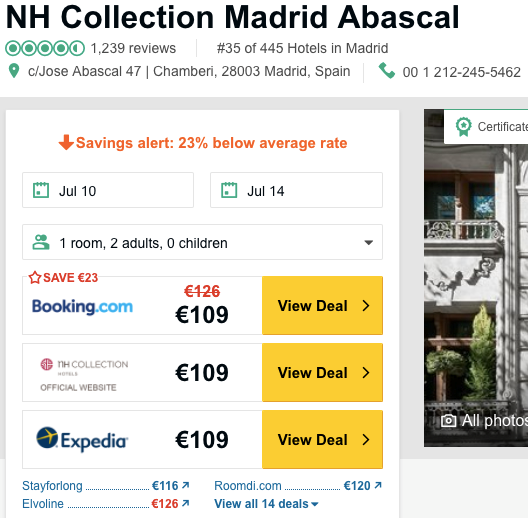 If metasearch engines didn’t exist, they would have to reinvent them with another format which had the same purpose: quickly comparing the price of a hotel on different channels. The disappearance of metasearch engines would also not be good for hotels, since they would lose a showcase that was not OTAs where to gain visibility. Metasearch engines, whether we like them or not, are more of an opportunity than a threat for hotels and their direct sale. So, which options do hotels have? 1. Set a middle-term target scenario. Metasearch engines are here to stay and it is best to understand which relationship we want to have with them and to which point we want to have them in our maximum profit, a scenario which is a far cry from the current situation. We must aspire to be on metasearch engines with our direct channel integrated in them and with the presence of some OTAs, but always a reduced number of them standing at 3-4 and where our direct channel can have the best price freely and “without pressure”. This would be the objective we should aspire to in the middle term. The fact that removing OTAs from metasearch engines is almost impossible in today’s day and age does not mean that we should not at least try it. It would be good that you asked for it in each meeting with your Booking.com or Expedia account manager. At first you will be met with a shocked reaction followed by a negative answer. Nevertheless, don’t stop asking for it. Sooner or later, someone will manage it. Also, it is always good to make petitions to OTAs that will be denied because these will be your bargaining chips for when you receive other requests from them, such as removing the best price from your website or opening more stock up for them. These requests will help your relationship with OTAs reach that uncomfortable balance point, because despite being uncomfortable it is still balanced. Limit one brand per OTA. What you must try with more insistence is that large OTAs bid with a single brand and that they do not take over with their whole portfolio because this would make your metasearch engine campaigns more expensive and, therefore, less profitable. This is the case of Expedia with Orbitz, Travelocity, Hotels.com or Hotwire. It is also the case of Booking Holdings with its brands Booking.com, Priceline, Agoda and Kayak. Their strategy is to occupy the maximum space possible with their different brands, with the hope that the user finally clicks on one of them, thus burying their competition’s entries at the same time, which is where your direct channel will end up most of the time. Clauses in B2B contracts. As well as trying to eliminate all the brands except one from the main OTAs, what we should internalise are, when dealing with B2B contracts (bed banks or OTAs like Expedia), clauses to prohibit not just AdWords but also the presence on metasearch engines of all the OTAs to who they resell their rooms. The objective is to avoid results like this one, where you cannot get the desired visibility with your official website because these OTAs bid higher than you. 3. Set maximum bids. Removing OTAs will be difficult, which is why another alternative is to limit their bids, at least in your strategic markets. Beating OTAs in bidding budgets is difficult and could seriously inflate your campaign costs. A good alternative is to set the OTAs’ maximum bid on each metasearch engine, so that you can guarantee competing with them, especially in the direction of our target scenario of few OTAs and the best price on your own website. 4. Setting a better price on your website. You have an alternative to what we set out in this post. Just have a better price than OTAs and you will achieve the desired showcase plus all the bookings. It is an option which does have its complications and that will land you in hot water with OTAs but one that we recommend at Mirai. Once again, OTAs have taken the lead in the relationship with metasearch engines and hotels now have to swim upstream. However, it is better late than never, especially now that metasearch engines are quickly becoming the first step in searching for a hotel, a territory which was almost exclusive to OTAs up until recently. As always, first of all it is best to know the situation as well as the different actors. The world of metasearch engines changes quickly and the simple fact of knowing what is going on will put you in a solid position to make the best decisions and boost your direct channel. Direct sales have once again shown that they are more a strategic than technological matter. Reordering your distribution and limiting its reach on the Internet are key steps to take if you want to make your direct sales grow. Meta’s (in particular Trivago) is doomed. They destroy value for the industry. The problem for them is that their incentives are not aligned with the OTA’s (therefore can never be a good partner) and not aligned with the hotels either. They are incentivized on generating the highest # of qualified referrals, regardless of commission or likelihood of conversion for the OTA – they destroy the “point of origin”/initial hotel display which is where OTA’s create/capture the most value – as they serve the highest take rate inventory combined with highest likelihood of conversion (to maximize value per display). Meta’s take out that value capture and hence OTA’s shouldn’t pay for their services and is the reason why they are pulling back (in particular Booking.com) – this will in the long-run ease the pressure on AdWords/top of the funnel where they have been ridiculously competing at the cost of the consumer. If OTA’s leave the meta sites the Meta sites turn to an OTA with a worse display (as they are incentivized differently) – OTA’s are going to be the dominating player in this market once again – and believe it or not, their approach actually creates value for the hotels as the incremental sales come in at very high incremental gross margins (regardless of the cost of commission). Higher take rates often means that the hotels in question is in more need of the booking, i.e. they are willing to cease higher commission to get the incremental gross margin, the lower profitability for the hotel, the higher impact on those incremental sales than for a more profitable player. This in turn creates a favorable and transparent market for the consumer as they have better selection (because smaller independent hotels can stay profitable) and more competition. I don’t have any vested interest in OTA’s – it is just my analysis. Thanks a lot for taking the time for your very detailed response. I don’t agree metas destroy value. Well, they do for OTA as they compete with them both to be the gatekeeper to start looking for a hotel, but also to find the cheaper place to make your booking so that OTAs have to share their commissions with hotels. They don’t destroy value, though, for both hotels and end users. Hotels don’t care OTA share their margin with metas. What hotels care about metas is that they can connect their direct channel and compete with OTA to get the clients. Of course, it’d be great no to have any meta or OTA and that all clients would check all hotel websites in each destination. But that will never happen, and metas are here to stay. If metas wouldn’t exist, all the business would go to OTA. And of course, end users love metas. They can find cheaper rates for the same rooms (a pity that hotels do not control their prices yet). I do think hotels can take advantage (and make money) of metas if they play well the metas game. Otherwise, it’s better to leave and let OTA fight with each other. My point was that they actually destroy profit for the industry as a whole, not for the individual hotel, where I agree it doesn’t matter. Meta’s are not here to stay, it is a doomed proposition, they are too dependent on Booking and Expedia. What I was predicting is effectively playing out as we speak. Look at Trivago’s share price the last two days, after they released their latest report – it is not a sustainable business model. They destroy value for their biggest customers (the OTA’s) so they increase their ROI targets for the channel, and because of that they generate less value from the referrals, which in turn implies that they can’t spend as much on acquiring traffic – if they can’t acquire traffic their business is gone. I agree metas are still too dependent on large OTA. However, if they manage to access other sources of inventory such as long tail OTA and, especially, the direct channel, they’ll stay for a long time. Large hotel chains campaigns to foster direct sales are very beneficial for metasearch as hotels need a place to show their rates are better. We connect more than 1,200 hotels to metasearch and our customer base is growing as many hotels (independent and small chains) have understood that they need to compete with OTA even though they need to pay tolls such as metasearch. In addition, long tail OTA are becoming more popular in metasearch. It’s easier to find several OTA in all metasearch, so the dependency on Booking.com and Expedia will slowly decrease. Finally, metasearch fills a user need. As long as end users keep looking for different rates to book a hotel, metasearch will have a space and will succeed. The only real enemy of metasearch is rate parity. But that is a chimera and not even large hotel chains have it yet. Let’s take Trivago as an example, more than ~80% of their revenues come from Booking and Expedia. They then use all of those revenues (right now 90% of revenues) to acquire customers, either in performance marketing channels (mostly Google) and through brand advertising (mostly TV). 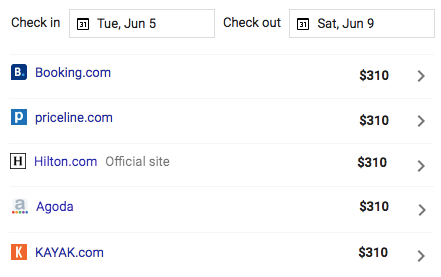 Booking and Expedia is now increasing their ROI targets for traffic coming through Meta, as they find this channel very value destructive for them. The only way they can keep spending 90% of revenues is on the bet that they will eventually either be able to generate a lot more “free traffic” through repeat usage or that they get paid significantly higher per referral (this number is going down as ROI targets increase). If 80% of their revenue (and they are super dependent on revenue to keep growing) is pressured and going down on a revenue per click basis, they can’t keep spending as much as they are doing on advertising -> they are not going to grow and rather decline (like Trivago is doing atm, declined -3% in last quarter). Ultimately, if they are a facilitator of direct bookings for the hotels, they will need to charge similar % commissions as OTA’s otherwise they can’t compete to get those clicks on Google. The only reason they haven’t so far is because they want to grow and scale (and purposely under-earn). If they can’t scale, their current business model is unsustainable and they will die. Booking pulled out at the right time before they became too powerful. However, my point is: there will always be room for metasearch if prices are not controlled by the hotel. As the latter will continue to exist, my opinion is that metasearch will not only exist but grow, as they fill an essential need of the end user: comparing and finding the best rate out there. Your point is very valid. However, if metasearch did not exist, somebody would create it! In addition, according to Phocuswright, more than 40% of the travel traffic already is originated in the meta layer and not the OTA one. That means, OTA cannot get out of metasearch that easily. They could have killed all meta players when they had the chance. However, they played hard and bid very strongly. Now, they cannot get out and expect not to lose any traffic as that would not happen. Trivago is not the weakest of all, and it’s ultimately owned by Expedia, so Booking has to be careful with it. The big threat to OTA is Google as they can afford to lose money in the short term but get more and more users to use their meta tools. Finally, for hotels to sell more directly, the meta layer is a perfect, but expensive, one. It’s slowly moving on but it’ll work. They may end up paying as much as an OTA sale, but the client is theirs, which makes a huge difference for cross-selling, up-selling and rolling out loyalty programs. They can continue to exist – but not be competitive (under their current model) as they just can’t compete on traffic acquisition, due to structurally worse unit economics. Consumer can price compare on Google’s meta instead – which is substantially better for OTA’s as the advertising dollars that they give Meta’s are spent on competition on Google. 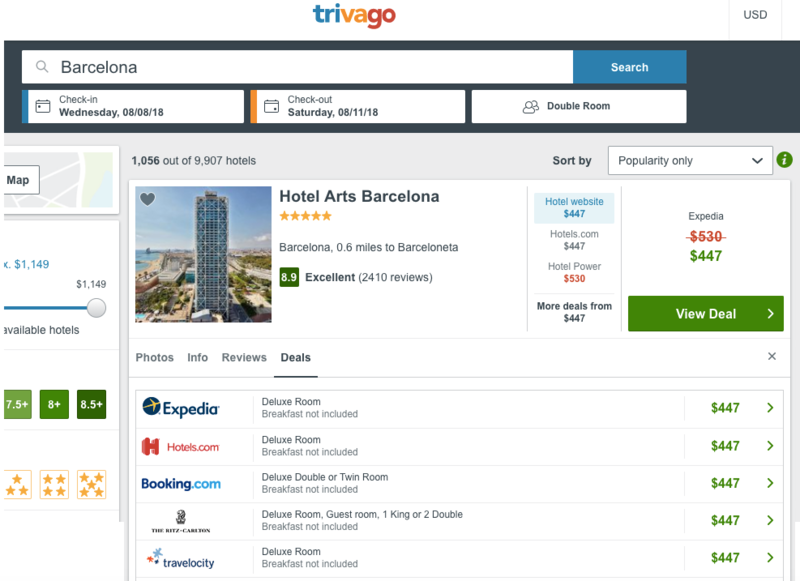 Trivago generates 85% of revenues from Booking and Expedia – while only 10% of revenues for Booking/Expedia are through Trivago. So they can easily kill them and pull all of their inventory – those 10% would come through other channels then instead. They realized their mistake and now they are doing it in real time – check Trivago’s share price over the past year, it is down more than 80%. Of course, they are losing traffic whilst they are pulling out – but ultimately it is a great strategic move from them. Hi Matteo, thanks for your comment. What I mean is that hotels should ask OTA to set a maximum bid for each market in metasearch so that hotels can guarantee first position with a reasonable bid. For example, ask Booking.com to bid a maximum of 0.6€ for the UK market in Tripadvisor so that you can bid 0.8€ and get the first position. This is something that became quite common for the Adwords campaigns, but that no hotel has achieved in metasearch. OTA will probably say no, as they have little to win and a lot to lose. They know you cannot force them and will take advantage of their dominant position. 1) A country decides its time to regulate industry based on near monopoly conditions, creates an official online OTA in order to keep massive commission $$ from leaving the economy of a country. 2) A hotel association gains enough power and member consensus to remove all inventory from OTAs and create their own commission free booking site. If all inventory ONLY on Official Booking Site, millions of commission $$ stays in even small towns. 3) Hotels have ZERO bargaining power with OTAs if they aren’t united to collectively bargain. Once Local or Regional booking sites are created, hotels can remove inventory from OTAs during peak times (since they will fill up with direct bookings anyway) and guests will be trained to book via direct channels at low cost of acquisition since Regional association booking sites have zero bid competition during peak times.